Tannis's brother Chad and his family were out for a quick visit last week. Of course our girls were ecstatic about hanging out with their cousins. 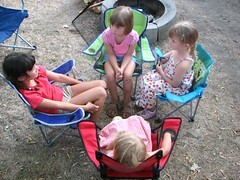 When we first met them at their campground, they sat in this little circle of lawn chairs and caught up on the latest news for at least 20 minutes. When they started bouncing around, we took them for a long walk down the creek to the lake to tire them out. The next day the whole crew hung out at Sunoka and went pedal-boating (witness the delight on Ivy's face). For a late lunch we met at Thornhaven for a picnic and a bottle of wine. The kids were great together, and the grown-ups got to sit around and talk more than usual. Later on everyone convened at our place for supper and after eating we took the kids down to Peach Orchard Beach so they could burn some energy on the playground. Great visit overall, but way too short -- next time we'll insist they stay three or four days. I can only imagine how badly your girls wanted their cousins to stay longer. That chair circle pic! Classic photo, eh? They were so blissfully happy to play with Tyra and Marissa for a day that they didn't even complain about the length of the visit.